This is my son. 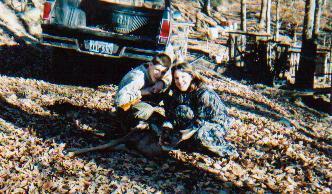 Last year (2002) he was fortunate enough to not only get his first deer on doe day, but later in season, he also got a second deer as well. Way to go Chris! I had been hunting on the backside of our property watching a meadow where we had seen several deer come out to feed. I was sitting in a little shack where I could put the barrel of the rifle between boards if the opportunity presented itself. I had been there between 10-15 minutes when I saw a doe jumped out into the meadow about 100 yards away. I grabbed the 30-30, and put it between the boards. The first 2 shots I cleanly missed. The doe ran off, then stopped, and then ran back towards me. By this time she was about 120 yards away from me. I shot the third time and it was a hit. I knew I hit her as she kicked back legs really high. Then she began to run off again, going about 50 yards and then dropped. A neighbor came along and helped me drag it out.